5 Signal the Penalty Fouls with possession by the team that was fouled: (The following does not apply to goalie interference and crease violations with possession in the crease; these cases are covered later.) Throw the flag straight up into the air (10 to 15 feet). Yell Flag down! Allow the offensive team (with possession) to complete their play. 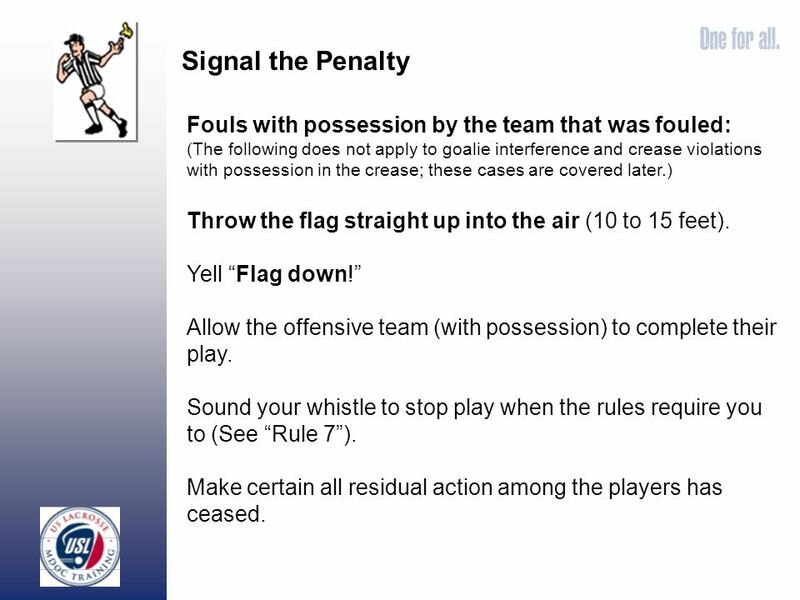 Sound your whistle to stop play when the rules require you to (See Rule 7). Make certain all residual action among the players has ceased. 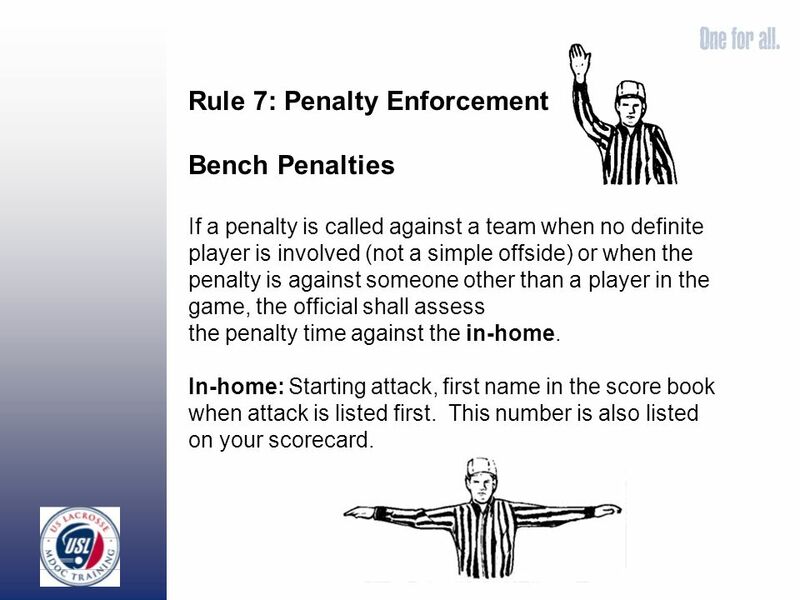 7 Rule 7: Penalty Enforcement Bench Penalties If a penalty is called against a team when no definite player is involved (not a simple offside) or when the penalty is against someone other than a player in the game, the official shall assess the penalty time against the in-home. In-home: Starting attack, first name in the score book when attack is listed first. This number is also listed on your scorecard. 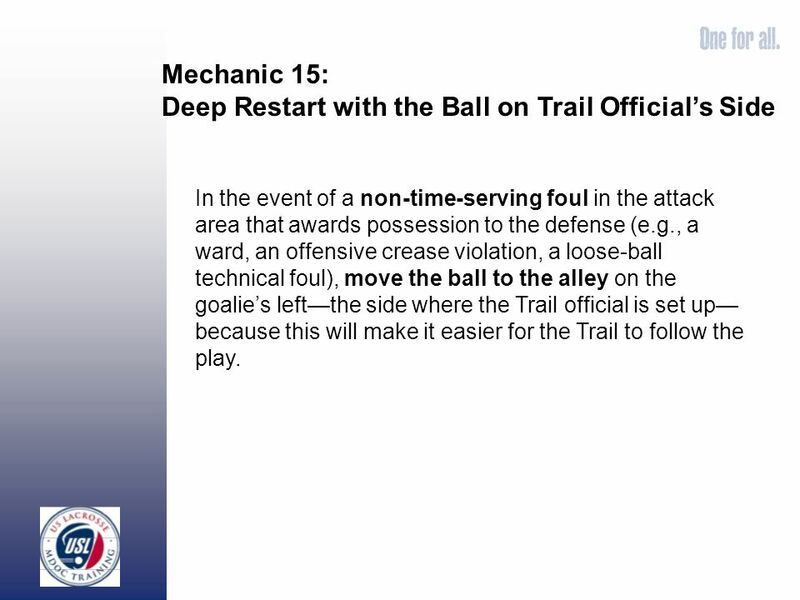 8 Mechanic 15: Deep Restart with the Ball on Trail Officials Side In the event of a non-time-serving foul in the attack area that awards possession to the defense (e.g., a ward, an offensive crease violation, a loose-ball technical foul), move the ball to the alley on the goalies leftthe side where the Trail official is set up because this will make it easier for the Trail to follow the play. 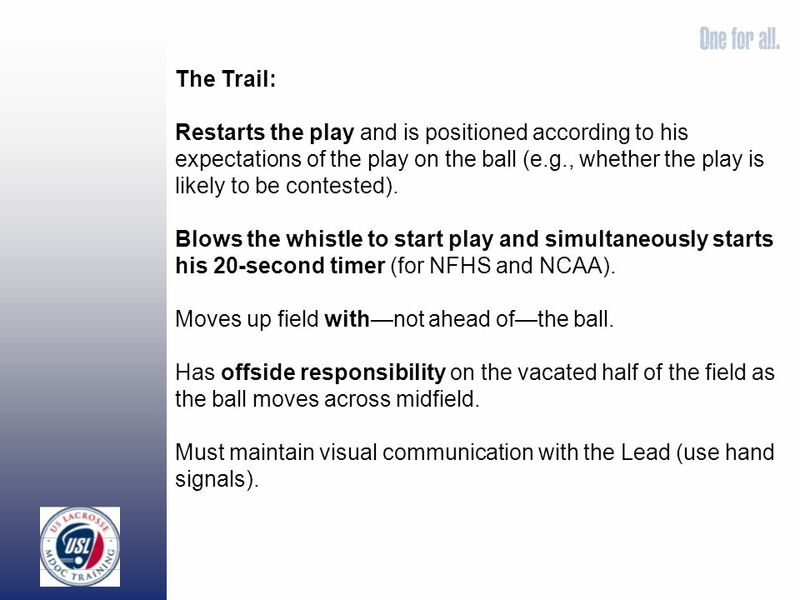 9 The Trail: Restarts the play and is positioned according to his expectations of the play on the ball (e.g., whether the play is likely to be contested). 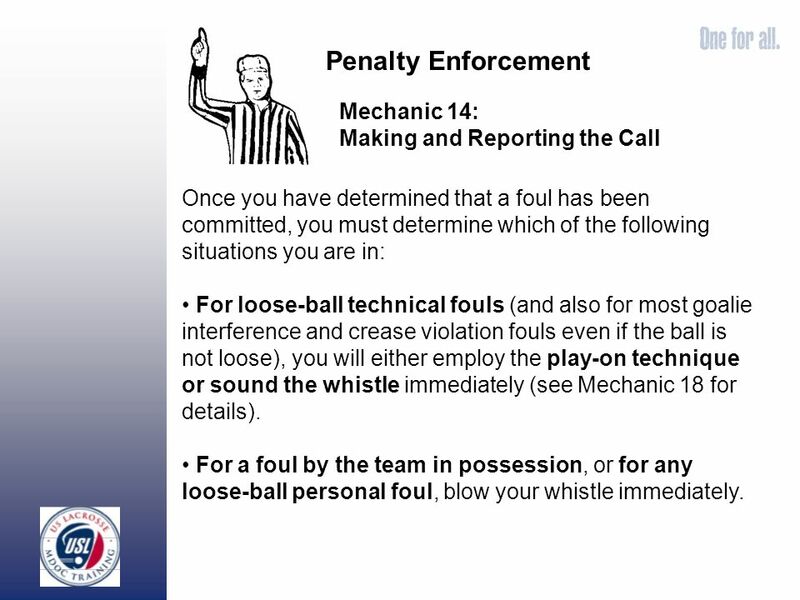 Blows the whistle to start play and simultaneously starts his 20-second timer (for NFHS and NCAA). Moves up field withnot ahead ofthe ball. Has offside responsibility on the vacated half of the field as the ball moves across midfield. 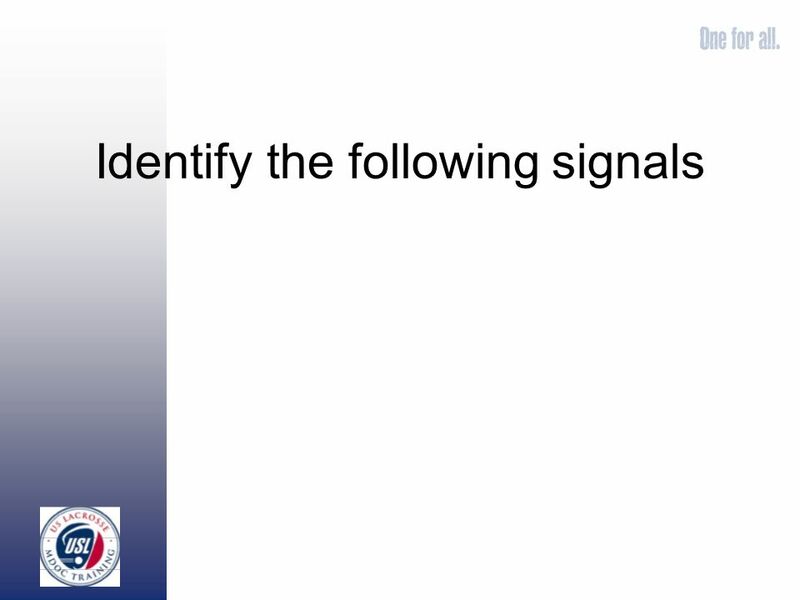 Must maintain visual communication with the Lead (use hand signals). 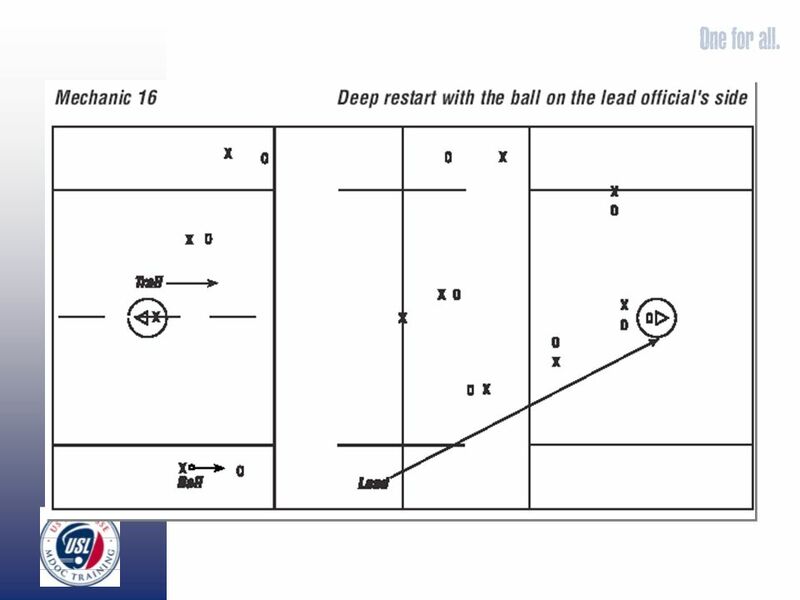 12 Mechanic 16: Deep Restart with the Ball on Lead Officials Side The Trail official may need to move across the field an appropriate distance to cover a contested restart but should stay on his side of the goal. 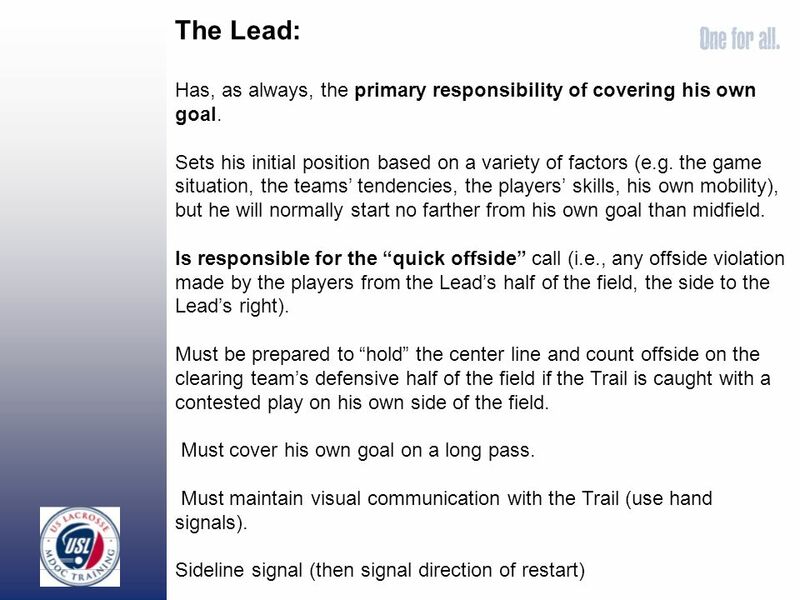 The new Lead should keep one hand up until a clearing- team players has possession and is in the alley (i.e., neither out of bounds nor in the attack area) since the Trail will likely not be able to see the far sideline. 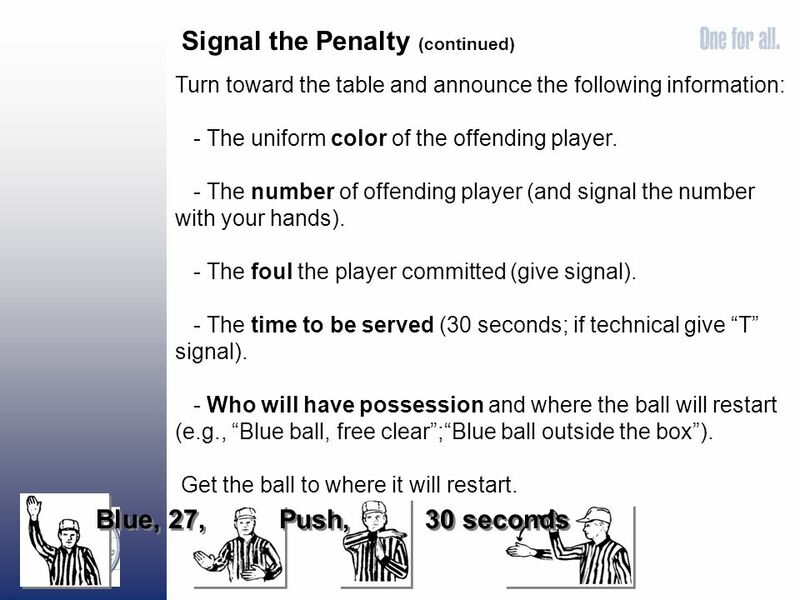 As soon as the player is ready, the Lead should point in the direction of the play and the Trail should blow his whistle and start his timer. 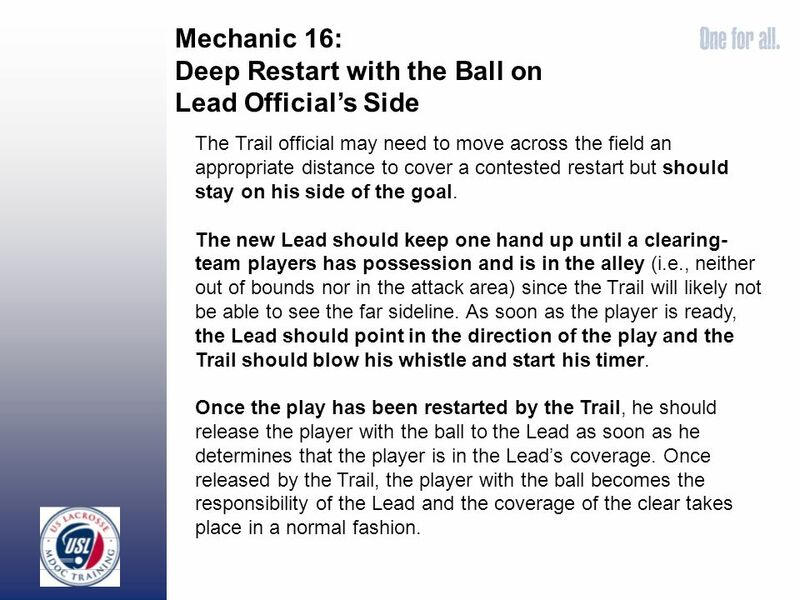 Once the play has been restarted by the Trail, he should release the player with the ball to the Lead as soon as he determines that the player is in the Leads coverage. 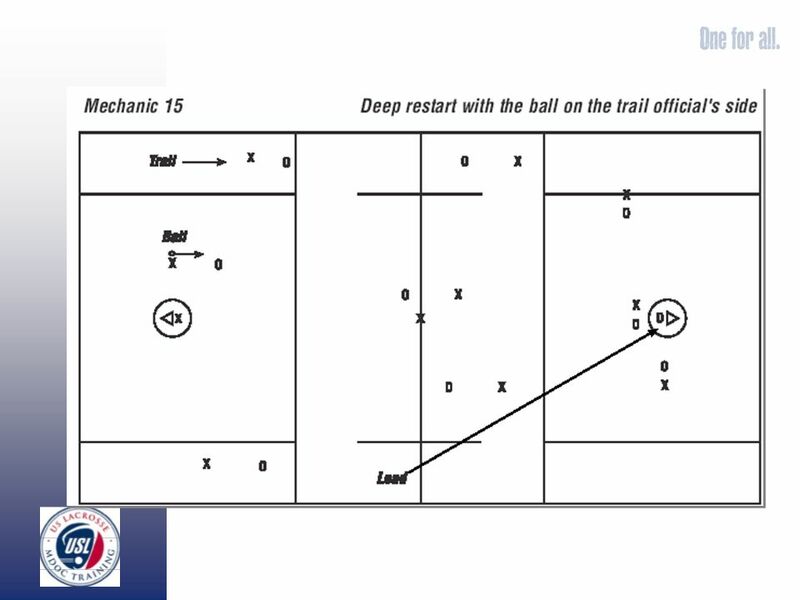 Once released by the Trail, the player with the ball becomes the responsibility of the Lead and the coverage of the clear takes place in a normal fashion. 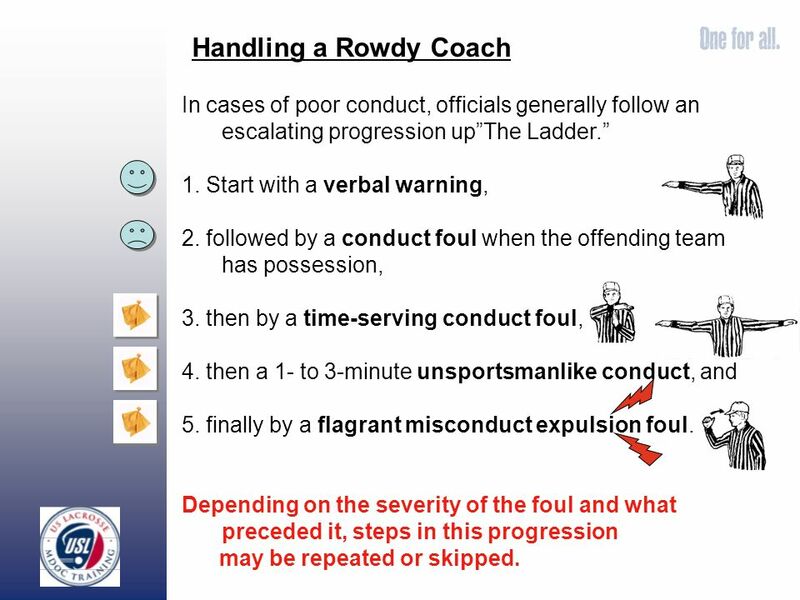 14 Handling a Rowdy Coach In cases of poor conduct, officials generally follow an escalating progression upThe Ladder. 1. Start with a verbal warning, 2. followed by a conduct foul when the offending team has possession, 3. then by a time-serving conduct foul, 4. then a 1- to 3-minute unsportsmanlike conduct, and 5. finally by a flagrant misconduct expulsion foul. Depending on the severity of the foul and what preceded it, steps in this progression may be repeated or skipped. 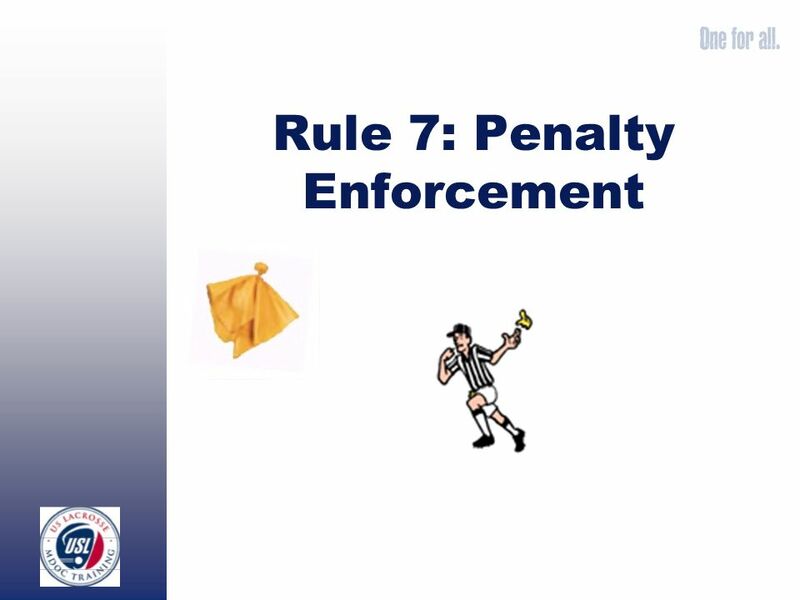 Download ppt "Rule 7: Penalty Enforcement. 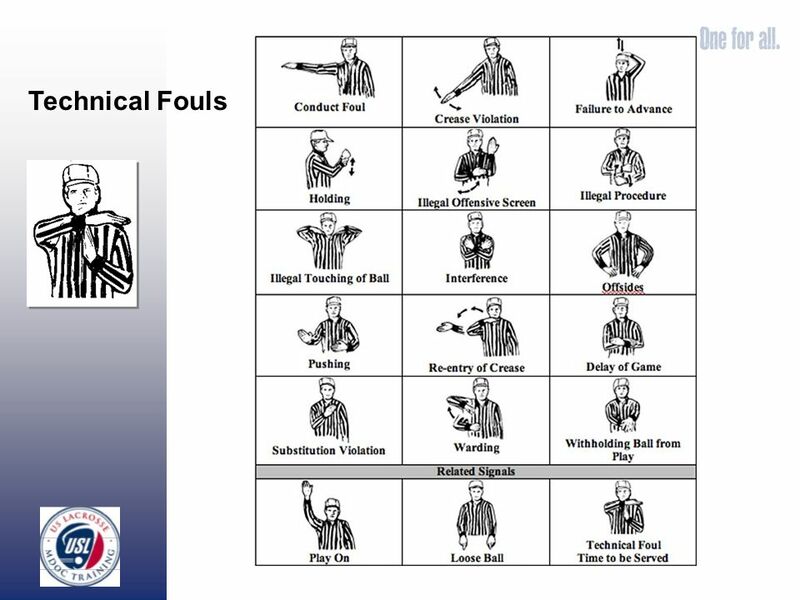 Once you have determined that a foul has been committed, you must determine which of the following situations you are in:"
Rules 5 & 6 Violations and Fouls. If a player commits a loose-ball technical foul or crease violation and the offended players team may be disadvantaged. 3-Man Pre-Game Faceoff Lead Has whistle on restart for a violation Discuss Leapfrog or not Watches shooter and passer until takes over goal from single. 1 New Officials Training Day 3. 2 Rule Changes Allows either an X or a 4-inch contrasting color square to be used as the location for the faceoff. Two Man Mechanics Updated 2/6/12. The Mission of our Mechanics To put us in the best position to make the calls that allow us to keep the game safe and. Originated By John P. Hill 2 Man Mechanics Last Updated 1/12/11. Officiating Philosophies – Miscellaneous & Personal Fouls José M. Rebés EFAF Officiating Clinic 2008 Vantaa, Finland. Three Man Mechanics Updated 2/6/12. 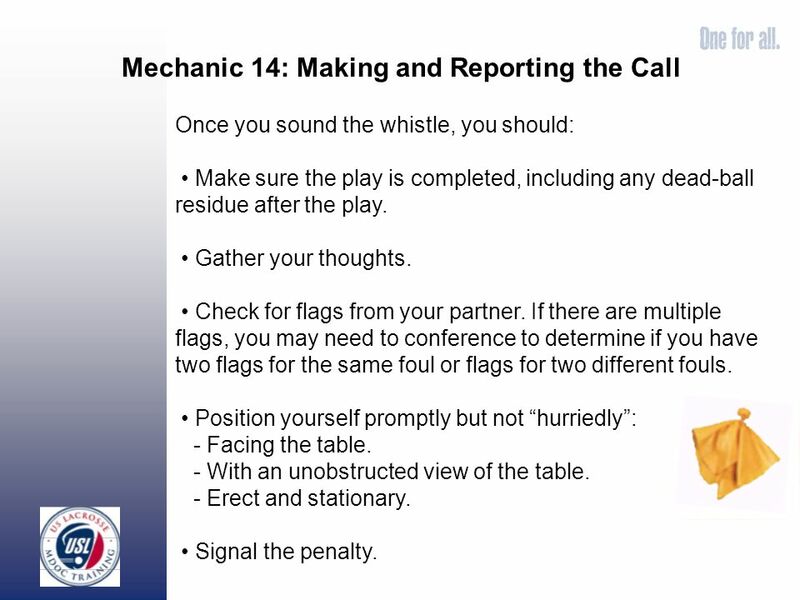 The Mission of our Mechanics  To put us in the best position to make the calls that allow us to keep the game safe. 1 Goal scored. 2 Goal definition A loose ball completely inside plane formed by rear edges of goal posts, crossbar, and goal line. NFHS RULES 2010 Proper Penalty Procedures And Enforcements. THE PRE-GAME CONFERENCE MDP Peter McDonald. THE PRE-GAME CONFERENCE TWO TYPES OF PRE-GAMES  Mini Pre-Game: 10 Minutes  Extensive Pre-Game: 30 – 45 Minute. Penalty Stacking Situations based on the 2014 NFHS Boys Lacrosse Rule Book and the NFHS Boys Lacrosse Rule Interpretations Memo dated Jan 28, Prepared. Faceoff Rules March 17, 2008 CPLOA Officials Association. Simultaneous, Dead Ball and Multiple Fouls. 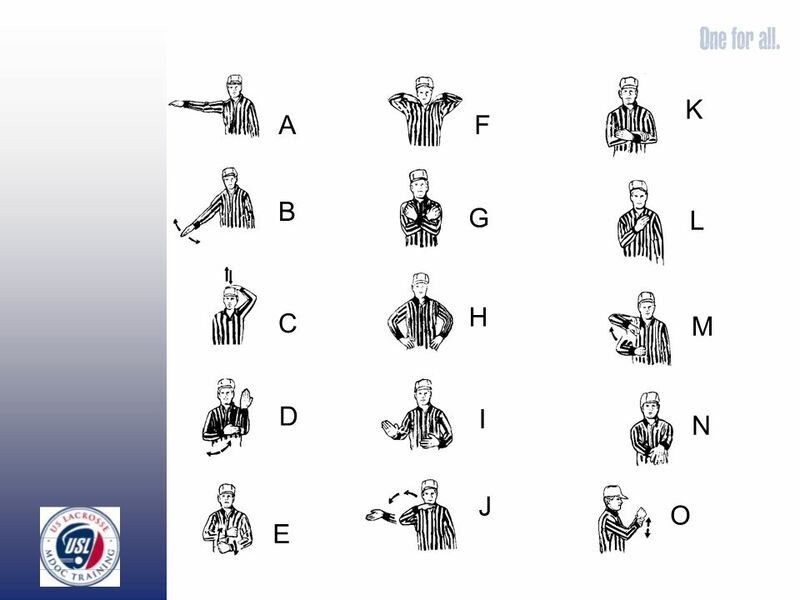 Definitions Simultaneous Fouls – fouls called on players of opposing teams during: – A live ball – A dead. 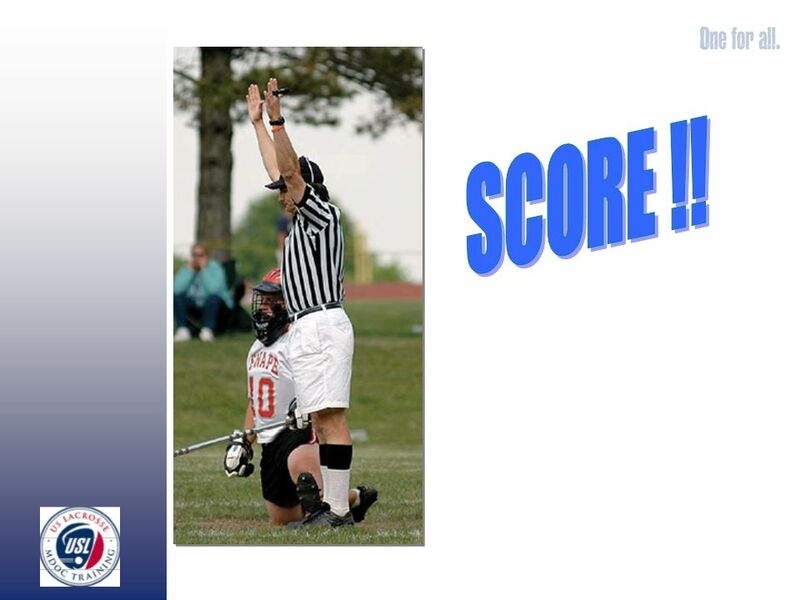 KLOA Personal Fouls Meeting 3/12/12 Keystone Lacrosse Officials Association. 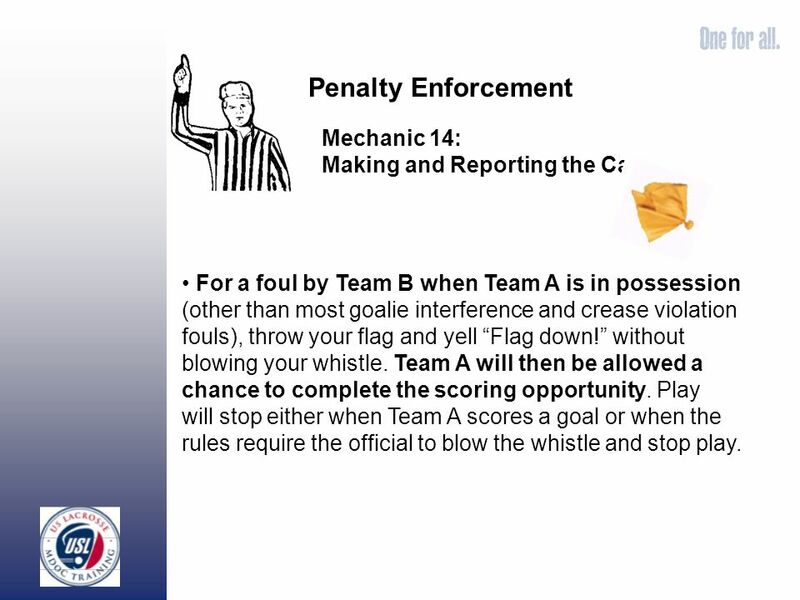 Central Pennsylvania Lacrosse Officials Association (CPLOA) Officials Training Rule 4, Sections 1 through 13.